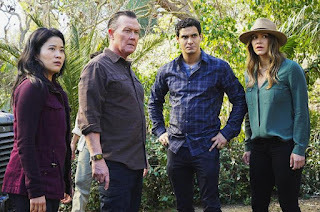 With all the crazy monkey business that went down this week, the members of Team Scorpion are still going through huge emotional transitions and changes in their real lives. A deadly disease is spreading in South America and threatening a pandemic, so the World Health Organization tasks Team Scorpion with running DNA tests on the one species of primate that is, so far, immune to the disease. So the team, minus Sylvester, head down to another fictional country and spend the day running around in the Amazon, trying to catch a monkey. Literally, that’s what they do. And after they do catch the monkey but fail to identify the reason it is immune, a local kid who has been helping them starts showing symptoms. Not only is the kid on the verge of death, but the team may have been exposed as well. The team finally identifies, by testing the monkey’s poo, that the source of his immunity is the fruit of the local Von Von tree. And so it comes down to finding a tree (the specific species having recently become endangered, thanks to loggers) and shaking it to get it to toss them some fruit, and they’ve found a cure. Oh, and they also electrocute some spiders along the way. 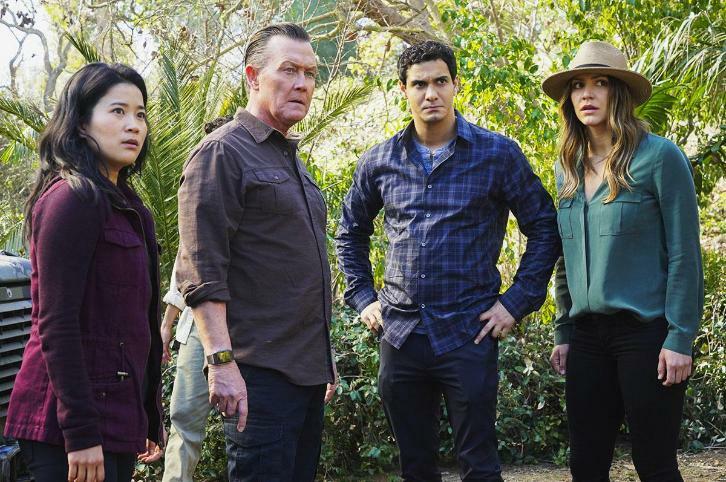 The case was really fun, especially with what was happening between Toby and Happy — more on that later — and with Cabe’s emotional drama. And honestly, every time the team gets to travel to another country, it is always a good episode... no matter how fictional that country is. Now as to the characters and what they are going through, let’s start with Cabe. The team’s surrogate father recently broke up with the first woman he actually liked and dared to start a relationship with in a very, very long time. It’s a rough time for Cabe, since the break-up was sudden and unexpected. Cabe is having a hard time accepting this breakup, especially after the way he dealt with what the relationship meant to him and getting older. Sylvester, on the other hand, now that he does not have the elections occupying his time, is focused on a new project: producing square-shaped tomatoes to maximize coverage on square bread. That’s on the surface, but what is really happening to Sly is what has been happening all season, which is that he is slowly growing and overcoming his worst fears. As he has been all season, Sly starts the episode admitting a new fear, and this time that fear literally cripples him. That is until Ralph makes him realize that it was all in his head, that he is projecting and using these fears to push himself back when in reality he has outgrown them. Once again, as slow and steady as it has been, I think Sly has had a great arc this year and his development has been perfectly mapped out. And then there’s the soon-to-be-wed Toby and Happy. This week saw a little trouble in the Quintis paradise. Happy insists they should see a therapist before they get married, and of all the therapists in town, she chooses Dr. Cecil P. Rizzuto, the unorthodox doctor that had previously “cured” Toby and Walter’s relationship. Of course, this doesn’t go over well with Toby, who disapproves of everything about the doctor. The problem seems to be that Toby is incapable of seeing any of Happy’s flaws, which — as endearing and sweet as it is — certainly isn’t good for a relationship. Dr. Rizzuto suggests Toby use a little invention of his called the Bicker Clicker. Whenever Toby feels Happy does or says something that should cause them to bicker, he would click the clicker. And while Toby starts off believing that he is going to return with a zero count on the clicker, as the day progresses, he starts to use it. Repeatedly. And most dramatically when Happy insults the hat, of course. By the end of the day, Toby has used the clicker 131 times. Believing they had failed the test, the couple return to the doctor truly pissed off at this experiment, but he only tells them what we’ve known all along: those two were made for each other. Ralph has a little side story this week, besides helping Sly realize his fears are all in his head. He starts the episode by announcing he needs a new haircut. He has outgrown the blue bowl cut his mother has been giving him. Paige finds this hard because she believes her special young boy is growing, conforming, and is probably allowing peer pressure to get to him. And while I doubt most kids his age choose a haircut by developing a computer program to help him decide, in the end, it turns out he just needs a new haircut because his old one was getting in the way of him using his goggles comfortably. And speaking of Paige, the team’s emotional leader has two very cute moments with Toby this week, and the second one comes at a realization regarding Walter. After seeing that Cabe is having a hard time and their Homeland agent is nursing a broken heart, Walter offers to spend some time with him. In that moment, Walter recognizes another person’s emotional pain and shows empathy, as Toby points out to Paige. And the only reason he does is because he has had his heart broken, by Paige, and he knows and understands the pain that Cabe is in. Paige sees that, and for the first time realizes that Walter wasn’t just being petty with Tim, that he was truly hurt by her relationship with the other man. This little moment is a big moment for Waige, and hopefully this will trigger something that will finally push this relationship forward.